US demand for oilfield chemicals will rise 5.8 percent annually to $10.3 billion in 2019. Stimulation chemicals and drilling fluid additives will remain the largest and fastest growing types, but will slow considerably from the rapid pace of the 2009-2014 period. Key trends include a shift toward slickwater fracturing fluids and high-performance drilling muds. 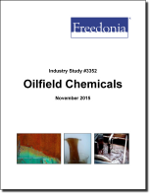 This study analyzes the $7.8 billion US oilfield chemical industry. It presents historical demand data (2004, 2009 and 2014) and forecasts (2019 and 2024) by fluid type (e.g., stimulation, drilling, cement slurries, completion and workover), application (e.g., stimulation fluid additives, drilling fluid additives, production chemicals, EOR products, completion and workover fluid products, cement additives) and material (e.g., specialty chemicals, commodity chemicals, polymers, gases). The study also considers market environment factors, details industry structure, evaluates company market share, and profiles 42 industry players, including Nalco Champion, Baker Hughes, and Halliburton.